Status: Rare spring migrant east, rare casual central. Uncommon, locally common, regular breeder east. Rare fall migrant east. Documentation: Specimen: UNSM ZM6887, 18 May 1901 Child’s Point, Sarpy Co. This species is a very early migrant, generally arriving in early Apr. There are few reports away from the mapped breeding range: 6 May 1984 Polk Co (Jorgensen 2012), 9 May 2002 Bazile Creek, Knox Co, 13 May 1991 Hall Co, and 11 and 13 May 2015 Homestead NM, Gage Co. The veteran observer for the latter report had not found this species in that county previously (Kent Fiala, pers. comm.). One in Thomas Co 12-13 May 1973 was listed as “hypothetical” (Bray 1994). Tout (1947) listed spring reports for Lincoln Co 4 May 1920 (“a dead bird too ‘ripe’ to preserve”) and 7 May 1933. High counts: 10 at Rock Creek Station SHP, Jefferson Co 18 May 2016. A total of 14 individuals were reported in 2011, 12 in 1996, and 12 in 2006. Summer: This species breeds locally on forested streams and creeks typically in hilly areas with sufficient declivity to expose emergent freshwater seeps, a habitat of limited distribution in Nebraska; these seep streams and creeks generally have rocky and gravelly substrates. Delineation of territories in 2014, 2015, 2016, and 2017 found that there were at least 37 territories in the state (Shari Schwartz, John Carlini, personal communication, eBird.org, accessed May 2017). The 37 identified territories were comprised of eight at Indian Cave SP in Nemaha and Richardson Cos, four at Platte River SP, Cass Co, a surprising 12 in Jefferson Co (five at Rose Creek WMA, seven at Rock Creek SHP), two at Fontenelle Forest, Sarpy Co, two at Schramm SP, Sarpy Co, two at Ponca SP, Dixon Co, two on Canyon Road, Douglas Co, and one each at Wilderness Park, Lancaster Co, Hickory Ridge WMA, Johnson Co, Twin Oaks WMA, Johnson Co, Osage WMA, Johnson Co, and Neale Woods, Douglas Co. Among these, 9 nests were found, and there were 14 territories with juveniles observed. There are only three locations known to have multiple territories: Indian Cave SP in Nemaha and Richardson Cos, Platte River SP in Cass Co, and creeks and streams in the Little Blue River drainage in Jefferson Co. Discussion of each follows. At Platte River SP, a nest was located in 2010 and photographed 16 and 21 May 2010. Studies in the park, along Stone Creek, began in 2012 (Shari Schwartz, John Carlini, personal communication), and in 2013 five territories were identified, with juveniles noted in four of these on 26 Jun. The four territories occupied on Stone Creek in 2014 along with the three nests located were mapped (Silcock 2014). Single nests located in 2016 and 2017 on Stone Creek were both lost during flood conditions; this is a recurring cause of egg and nestling losses along streams that tend to flash flooding after heavy rains (Shari Schwartz, pers. comm.). At Indian Cave SP in 2015, all of the drainages were surveyed; six territories were discerned, all on three adjacent streams near the south end of the park. However, Louisiana Waterthrushes have occurred on two drainages in the Nemaha Co part of Indian Cave SP but were not detected in 2015; we include these, for a total of eight. A total of nine adult and four juvenile waterthrushes were identified in 2015 plus one of unknown age, and one active nest was located. All birds had departed by 25 Aug. The first confirmed breeding report from Indian Cave SP was of an adult feeding a fledged juvenile 25 Jul 1988 (Grenon 1988). Louisiana Waterthrushes were first noted at Rock Creek Station SHP, Jefferson Co 8 May 2012. During extensive field work in 2016 along Rose and Rock Creeks and their tributaries, all in a portion of the Little Blue River drainage with shallow soils and limited agricultural development and referred to as the Sandstone Prairies (Schneider et al 2011), a surprisingly large number of territories and associated juveniles was discovered. At Rock Creek Station SHP, seven territories were occupied, with adults observed feeding 1-3 fledglings on three of them; at Rose Creek WMA, there were five territories, with an adult feeding a fledgling on one of them as well as a lone foraging juvenile on a seep stream; and there were four territories at Rose Creek West WMA (Shari Schwartz, personal communication). In 2017, two nests were found, one at Wilderness Park, Lancaster Co and the other at Platte River SP, Cass Co; both were flooded. Occupants were detected on three territories at Rose Creek WMA 11 Jul 2017. Apart from these three important breeding locations, there are scattered breeding records north in the Missouri River Valley and its tributaries to Ponca SP, Dixon Co, where one was “on territory” 3 May 2015, and two territories were located in 2017. In extreme northern Thurston Co, one was seen 18 Jun 1999, a pair was present 20 Jul 2002, 2-4 birds were there 4 Jul 2005, and one was there 13 Jun 2006. Breeding was confirmed in Washington Co, where birds were present along Rock Creek 7-31 Jul 1988 and seen carrying food 7 Jul (Grenon 1988); one was there 16 Apr 2014, and an adult was feeding a juvenile there 30 Jun 2016. For many years there have been 1-2 territories at Fontenelle Forest using the limited habitat there; Bedell (1982) found a nest 5 Jun 1982, another nest was found there 18 May 2006, and fledglings were being fed there 2 Jul 1983 (Williams 1983), 28 Jun 2003, and 7 Jun 2016. A pair at Wilderness Park, Lancaster Co has been present for at least four years through 2016; an adult was feeding a juvenile at a nest there 5 Jun 2016. At least one territory has been active at Schramm SP, Sarpy Co for several years (Donald and Janis Paseka, personal communication); one was present 9 May 2015, and two singing males were recorded in 2017. Additional Missouri River Valley sites where habitat may be suitable for breeding, but without evidence, are Bay Hills Golf Course, Cass Co, two along a wooded creek on 30 Apr 2015, Rulo Bluffs, Richardson Co one seen 8 Jul 2006, and Arbor Day Farm, Otoe Co, one singing 17 May 2015. The only other breeding season reports away from the Missouri River Valley and not mentioned above are of one at Schindler Creek, Knox Co 2-22 Jul 2009, one on Rock Creek near Steinauer, Pawnee Co 26 Jun 2006, singles in Thayer Co 14 Jun 2010 and 4 May 2015, as well as a singing bird at Meridian WMA, Thayer Co 17 Apr 2017, and one in southern Gage Co 30 Jun 2016. High counts: 9 at Platte River SP, Cass Co 25 Jun 2013, and 8 there 3 Aug 2014. A total of 63 individuals were counted in 2016: 18 on tributaries of the Missouri and Lower Platte Rivers, 36 in the Little Blue River drainage, five on waterways between Lancaster and Johnson Cos, two near Peru, and two at Fontenelle Forest. 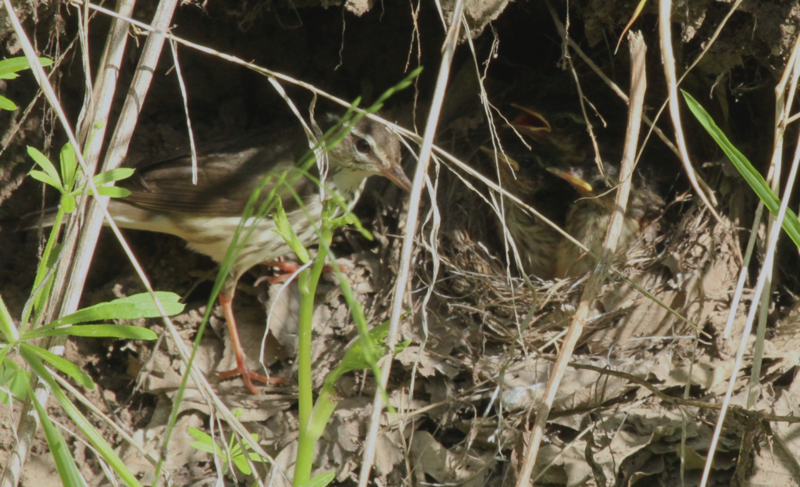 Louisiana Waterthrush at a nest with nestlings in a vertical stream bank at Rock Creek Station State Historical Park 18 May 2016. Photo by John Carlini. Louisiana Waterthrushes leave early, often in mid- to late Jul, but generally in Aug, with few reports in Sep. At Platte River SP in 2014, all adults had departed by 1 Sep. There is a later report 13 Sep 2014 Platte River SP, a juvenile with a drooping wing. Comments: The history of this species in Nebraska is inconsistent and poorly documented. Around 1900 it bred “rather commonly in suitable localities along the bluffs of the Missouri River at Omaha and Peru, and in Richardson Co” (Bruner et al 1904). Rapp et al (1958) echoed Bruner et al (1904) but added that it was a summer resident “as far west as Lincoln Co”, a statement with no supporting evidence, then or now; Tout (1947) listed it as a migrant. However, Johnsgard (1979) did not include Nebraska in this species’ Great Plains breeding range and in 1980 stated there was “no evidence of current breeding in the state” (Johnsgard 1980). By 2001, however, Sharpe et al (2001) considered Louisiana Waterthrush a “Rare regular breeder east” based on breeding records by Bedell (1982) and Grenon (1988), although Johnsgard (2009) did not include the species in the regular breeding range and did not mention any breeding records in Nebraska. Extensive field work from 2010 to date by Shari Schwartz, John Carlini, and Ross Silcock has revealed a significant population in the state, with an estimate in 2014-2017 of 37 active territories (see Summer), along with several nests found and numerous reports of adults feeding young (eBird.org, accessed April 2018). Recently, Johnsgard (2013) updated his account of the species, stating “Confirmed breeding during the atlasing years [Mollhoff 2001] was limited to Washington and Richardson counties … and breeding has been suggested or confirmed for Fontenelle Forest, Neale Woods and Platte River State Park”. Despite the large gap in reports of this species from the early 1900s through 1981, the single report during this period by Garrett (1944) of two nests at Fontenelle Forest in 1944 suggests that there may have been a population of Louisiana Waterthrushes in Nebraska throughout. There was another gap of about 25 years before Bedell (1982) and Grenon (1988) presented the next reports of confirmed breeding. Because its specialized habitat generally exists in remote and poorly accessible locations, finding and studying this species can be difficult even for observers familiar with its song and call notes. We believe that few observers have undertaken the challenge of locating nests, or even locating the species; there are no Nebraska BBS data on Louisiana Waterthrush (Sauer et al 2017), presumably since BBS protocol does not easily access waterthrush breeding habitat. For these reasons, we believe Louisiana Waterthrush has been present in Nebraska as a breeding bird since Bruner’s time but was not looked for and thus remained largely undetected for nearly a century. Shari Schwartz and John Carlini reviewed an earlier draft of this species account and provided numerous helpful comments that improved the content and composition. Photograph (top) of a Louisiana Waterthrush at Fontenelle Forest, Sarpy Co 1 May 2008 by Phil Swanson. Bedell, P.A. 1982. Louisiana Waterthrush nesting in Fontenelle Forest. NBR 50: 88-89. Grenon, A.G. 1988. Food-carrying Louisiana Waterthrushes. NBR 56: 81-82. Johnsgard, P.A. 2009. Birds of the Great Plains: Breeding Species and Their Distribution: New Expanded Edition (2009). University of Nebraska-Lincoln Libraries, Lincoln, Nebraska, USA. Johnsgard, P.A. 2013. The Birds of Nebraska, Revised Edition 2013. Zea E-Books. Book 17. Schneider, R., K. Stoner, G. Steinauer, M. Panella, and M. Humpert. 2011. The Nebraska Natural Legacy Project: State WIldlife Action Plan. 2nd edition. Nebraska Game and Parks Commission, Lincoln, Nebraska, USA. Williams, F. 1983. Southern Great Plains Region. American Birds 37: 1002-1004.